Have you checked out Gimme Radio yet? It’s a 24/7 metal radio service that has DJs like Randy Blythe, Dave Mustaine, Blasko and many more. Well, we’ve teamed up with Gimme Radio to give you a special limited offer. Get 3 months of access to all archived shows for just $0.99! Hear over 50 episodes of Hammer of the North – the show hosted by Johan Hegg of Amon Amarth. Hear a 2 part special on the History of Metal Blade Records by our very own Brian Slagel. And Listen to specialty shows and interviews with your favorite Metal Blade bands – Behemoth, Satan, Rivers of Nihil, Armored Saint and more. 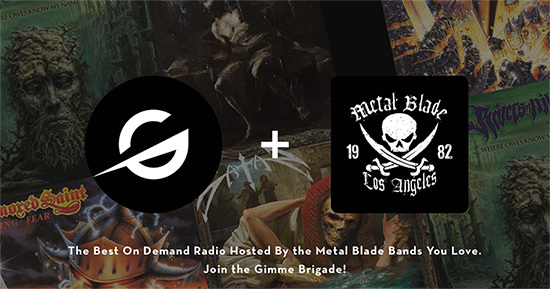 The service is free, but join the Brigade and you can listen those shows (and more) on demand / offline – whenever and wherever you want. Use the link below to join and get 3 months for just $0.99! And don’t forget to tune in today (Wednesday, February 6th) when Greg from Allegaeon does a guest DJ show at 4pm PT / 7pm ET. Gimme Radio: Extreme music for extreme times.